The 'Oxy Express': Florida's Drug Abuse Epidemic Each day, thousands of doses of powerful narcotics are freely dispensed in Florida's pain clinics. Hordes of people from across the Southeast head to the Sunshine State for drugs like oxycodone. 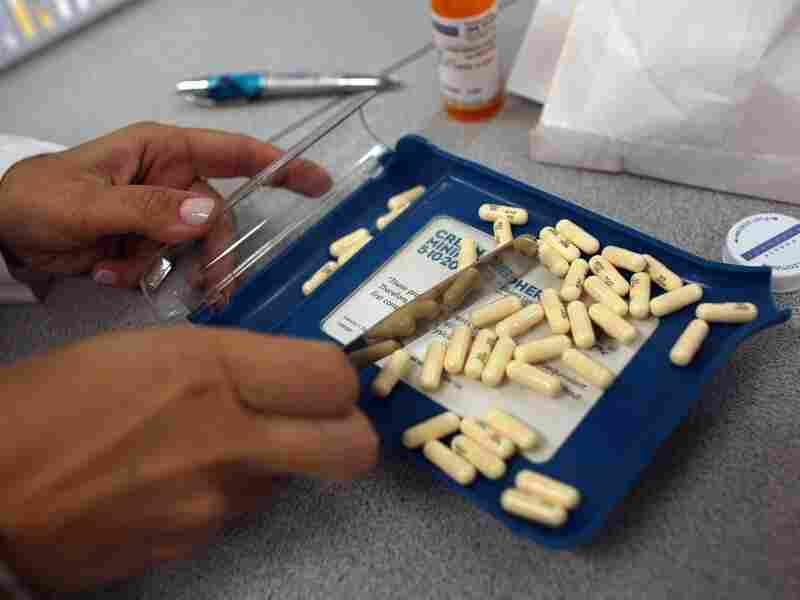 Florida lacks a system for monitoring prescriptions. A pharmacy manager counts out the correct number of pills to fill a prescription in Miami. Florida is the epicenter of a prescription drug abuse epidemic. Each day in communities from Jacksonville to Fort Lauderdale, thousands of doses of powerful narcotics like oxycodone are dispensed in pain clinics — storefront operations also called "pill mills." When he started at the Broward County Sheriff's department 30 years ago, Al Lamberti says, the department was raiding crack houses and busting junkies. "Nowadays, the drug dealers are working out of strip malls," he says. Lamberti heads the sheriff's office in a county that includes Fort Lauderdale. It's a city that has become a destination not just for spring breakers but also for addicts and drug traffickers. "We have more pain clinics than [we have] McDonald's [restaurants]," he says. "They're taking their toll." Lamberti recently joined a dozen federal, state and local law enforcement officials at a news conference held to announce a major crackdown on Florida's pill mills. It was a series of busts, from Palm Beach to Miami, that included more than 20 arrests and the seizure of more than $22 million in cash, exotic cars and real estate. Doctors in Florida prescribe 10 times more oxycodone pills than every other state in the country combined. People come from all over the Southeast to visit the state's pain clinics. Typically, doctors give them a quick exam and then a prescription for a powerful painkiller. Sometimes, they even fill the prescription on the premises. Mark Trouville, a special agent for the Drug Enforcement Administration, says over the past year the joint law enforcement operation has made more than 300 undercover drug buys from pain clinics — and more arrests are coming. At the news conference, Trouville had a warning for pill mill operators: "If you're a clinic owner or a doctor or an employee knowingly working at one of these pill mills, we have probably bought dope from you. And we are probably coming to see you soon." A major reason pill mills have proliferated in Florida is because, unlike most other states, it lacks a system for monitoring drug prescriptions. Law enforcement officials say that would help prevent "doctor shopping" — people who travel from one clinic to another, buying hundreds of doses of prescription drugs. In fact, Florida does have a prescription drug database. After years of lobbying by law enforcement, the state Legislature passed a bill last session to create one. It just didn't provide money to pay for it. A private foundation stepped in and began raising funds for the database. Florida Gov. Rick Scott says he is opposed to a prescription drug database because it is an invasion of privacy. But recently, Gov. 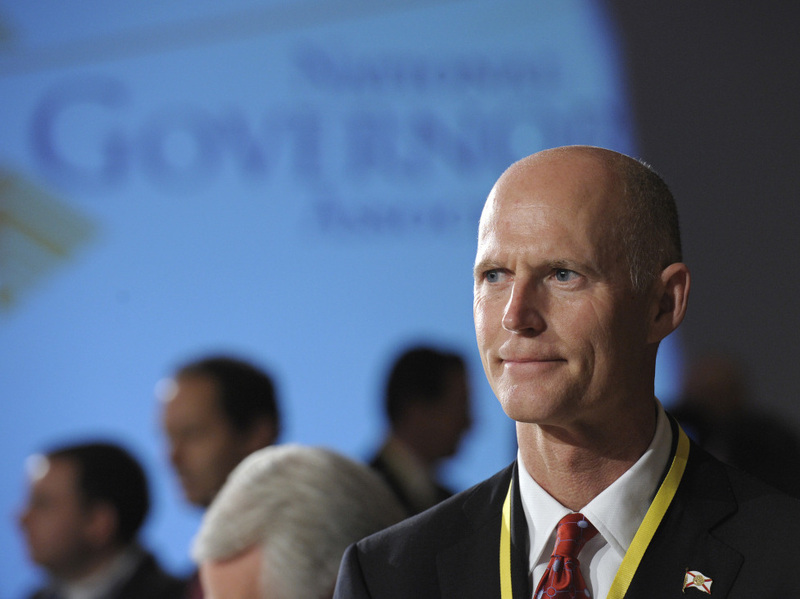 Rick Scott has come out foursquare against it. Scott hasn't said much about why he wants to kill it. When pressed at a recent news conference, he said: "I believe it's an invasion of privacy and ... it appears that the money's been wasted." An official with the Prescription Drug Monitoring Program Foundation says the governor's accusation is false and that the group has already raised enough money to start up the state database. In the past few weeks, a growing number of voices in Florida and outside the state have called on Scott to drop his opposition to the drug monitoring program. Many of Scott's critics come from states with their own oxycodone epidemics fueled by addicts and drug traffickers who make regular visits to Florida. It's a trip down Interstate 75 some now call the "oxy express." "I have friends that are ER doctors along I-75," says Kentucky's Lt. Gov. Daniel Mongiardo, who is also a surgeon. "It's a daily basis where somebody goes into an ER off I-75 with an overdose." In Florida, law enforcement authorities say the crackdown on pill mills will continue but that they can't arrest their way out of the problem. They're calling for stricter regulation of doctors and funding for the statewide drug database. Now, all they have to do is convince the governor.